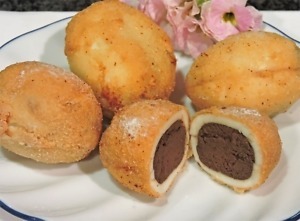 I came across a recipe for chocolate-stuffed, deep-fried, hard-boiled eggs in a classic Italian cookbook. The instructions were sketchy and the ingredients list didn’t give amounts for some things. I had my doubts, but tried to follow the directions as written; it was a total disaster. (The coating didn’t stick and the filling leaked into the oil making a spluttering mess.) I looked online to see if I could find another version of the recipe, probably passed down from someone’s Italian grandmother, in case it had been misinterpreted. Two other sites had the recipe, but it was exactly the same one. One of them even included a picture that made it obvious that their attempt was no more successful than mine. Assuming that there must be a way to make such a thing, I decided to start from scratch. It took several more tries, but I got it to work. So if you want something that is sure to be a conversation starter and might even help you resist the Cadbury eggs and marshmallow peeps, give these a go. Two of the eggs in the picture are duck eggs since I’m still allergic to regular eggs. Cook the eggs in their shells at the lower end of the temperature for hard-boiled eggs. An automatic egg cooker is helpful for getting the correct temperature. Don’t overcook them, since they will be cooked a second time. Immediately plunge the eggs into ice water so they will shell easily. Roll eggs on counter until evenly cracked and peel. Cut eggs lengthwise and carefully pop out the yolks. Reserve whites, keeping halves from original eggs in pairs so they can be fitted back together. Place yolks in the container of a food processor (a small one works best for this amount). Add cocoa powder, sugar substitute, cinnamon, and salt and process. Blend in brandy and process until it makes a smooth paste. Add water if it is too thick or more cocoa powder if it is too thin until it reaches a thick but spreadable texture, like cookie dough. Taste and add more sweetener if needed. To mix filling by hand, crush the yolks before adding other ingredients to prevents lumps. Place the raw egg white in a medium bowl. Add the 1 teaspoon of coconut milk or cream and whisk until blended and foamy but not stiff. Coat the flat tops of the filled egg halves with the liquid egg-white mixture and press matching halves together. Place eggs in refrigerator to chill for 15 minutes or so to set. Cover and reserve egg white mixture. Place cocoa powder in a small bowl and dredge eggs until lightly coated with no bare spots. Dip cocoa-coated eggs in egg-white mixture then place in bowl with almond flour and dredge until throughly coated. Return coated eggs to refrigerator until cold to will keep the chocolate centers from melting in the hot oil until the crust hardens. Heat cooking oil over medium-high heat until shimmering but not smoking. Add eggs one at a time and turn in the hot oil until lightly browned. Dip out and drain on paper towels. Arrange on a serving plate and dust with powdered sugar substitute. Cut in half crossways to serve. They are best when warm and crisp. Recipe inspired by one from La Cucina; the Regional Cooking of Italy. Makes 8 servings of 1/2 egg. Counts do not include sweetener, which is zero to minimal, depending on choice. I estimated the amount of almond flour actually used per egg and that 1 teaspoon of fat per egg would be absorbed from frying. You can use a high-intensity liquid sweetener, such as stevia or monk fruit, a powdered sweetener, such as erythritiol or oligofructose, or some of each to make the filling. The yolk mixture is already cooked so you can safely taste it to check for sweetness, so start with less and add more if necessary. Use powdered sweetener for dusting finished eggs, if desired. You can make these with any extra filling from the stuffed eggs or when you have extra egg yolks, as after making meringue. Form filling into small balls and roll in cocoa powder, chopped nuts, or flaked coconut. Use them to garnish the platter, if desired. Chocolate egg yolk truffles, Chocolate filled eggs, Easter treats, Fried food. Bookmark.